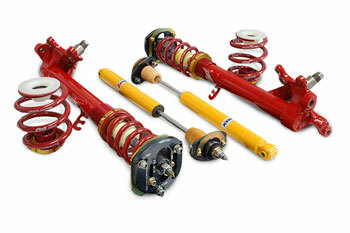 Ground Control single adjustable coilover kit for the BMW E30 is a hugely popular setup for the enthusiast. We have the best price! Everything you need in a package deal that can't be beat... Dollar for dollar the best setup around! Most people find that the stock, or even the popular H&R + Bilstein setup is just far from what they expect from one of BMWs most celebrated 3 series: lack of suspension stroke and height adjustability means uneven ride quality, lacking performance, and awkward looks. Certainly not what you were looking for, and far from ideal on either your street car or track vehicle. The Ground Control kit is a winner... We recommend selecting the "Short Front" housing option above for those who want to lower their E30 more than 1.2" and get the best looks, ride quality, and importantly -function at a low ride height. We also recommend adding our bolt-on VAC Roll Center Spacers for best results by correcting suspension geometry if you have an E30 M3. Available for ALL E30 Models, but please specify in box above. If you cannot decide on a spring rate, you may specify your general outline of your cars use in this box as well. 4 Eibach ERS springs, (not pro-kit), with a race OR street spring rate. professional install is highly recommended.